SERBIE – Corridor 10 - Une nécropole vieille de 2500 ans vient d’être découverte sur le tracé du Corridor 10, dans la sud-est de la Serbie. Il y a un an, c’était une nécropole de 4000 ans, près de Vranje. En tout, 33 sites majeurs ont été découverts sur le tracé de cet axe routier. Un livre contenant la liste de tous les sites exhumés dans la partie orientale du Corridor 10 sera publié une fois les travaux terminés. Une nécropole de l’Âge de fer vient d’être mise à jour dans la région de Pirot (sud-est de la Serbie). Les tombes contiennent des squelettes de guerriers enterrés avec leurs lances et leurs poignards. Pour l’archéologue Mirjana Blagojević, qui dirige les fouilles de la section du Corridor 10 près du village de Sinjac, la découverte de ce site funéraire vieux de 2 500 ans est unique : « Nous avons trouvé trois squelettes de guerriers avec leurs lances, poignards, fibule en fer, des ornements en bronze, des rivets, des jambières »… « Une découverte archéologique très importante », a déclaré Predrag Pejić, archéologue du Musée Ponisavlje de Pirot. « À Pirot, nous avons exhumé des tombes plus anciennes que celle-ci, mais les restes avaient été enterrés après leur crémation sur un bûcher funéraire, alors qu’ici nous avons affaire à une mise en terre des corps entiers par leur communauté ». Le long du tracé du Corridor 10, de Grabovnice à Leskovac, de Preševo à la frontière macédonienne, quelque 33 sites archéologiques ont été mis à jour. 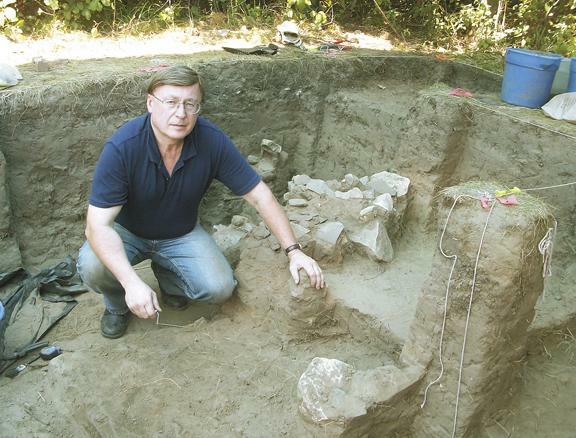 En juin 2012, une nécropole de 4000 ans avait été découverte à Ratunovac près de Vranje. ISRAEL – Legio-Megiddo - Israeli archaeologists have found ruins they believe are the site of one of the two Roman legions based in the country between 120 and 300 C.E. 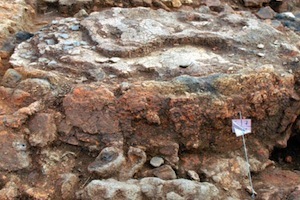 Israel Antiquities Authority archaeologist Yotam Tepper had long suspected that the site in the Galilee was the base of the Legio Sexta Ferrata, the 6th Roman Legion, also known as the Ironclad Legion. The other legion in the country was the 10th, based in Jerusalem. Over the past week, an expedition led by Tepper and archaeologist Matthew Adams found the base of a battery or wall, a moat surrounding the camp, water pipes, a covered sewage channel, coins and tiles. The legion’s symbol adorned a broken shingle. The site sits between two other historical gems: Tel Megiddo, the ancient fortified city that has been named a UNESCO World Heritage site, and the oldest known Christian house of worship, which was discovered around seven and a half years ago about a kilometer south. 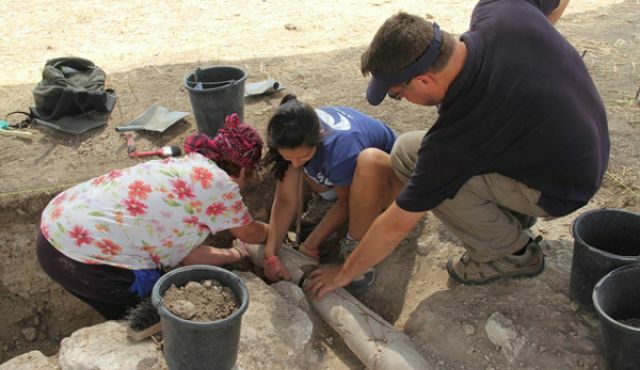 Tepper uncovered the Christian site during antiquities authority digs at Megiddo Prison in 2005. Now the legion site is in focus; it’s why the area became known as Legio. In Arabic, it was known as Lajun before early Zionists restored the name Megiddo. “We’re very excited,” said Tepper, who has been excavating the Legio-Megiddo area for 15 years. 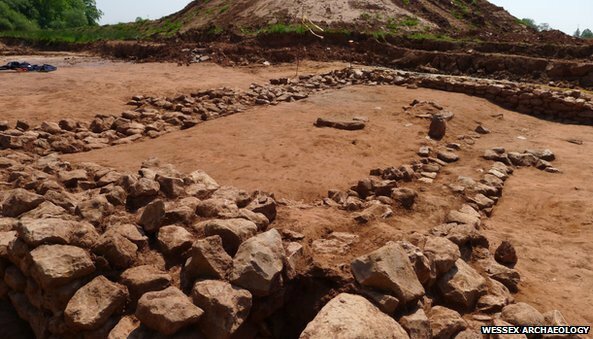 ROYAUME UNI – Longforth Farm - A previously unknown complex of medieval buildings has been unearthed at a site near Wellington in Somerset.A team from Wessex Archaeology made the discovery at Longforth Farm during a dig organised before new houses are built on the site. 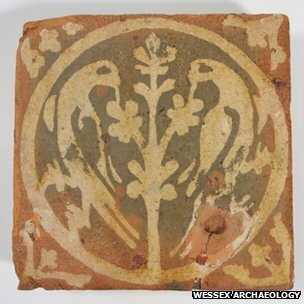 Experts say glazed ceramic roof tiles and decorated floor tiles suggest they were high status buildings and may be part of a religious or manorial site. The excavations have uncovered the remains of stone foundations in a pattern which suggests there may have been a series of buildings set around courtyards. Bob Davis from Wessex Archaeology said: "This is a significant find and therefore very exciting, particularly as there are no documentary records that such a site ever existed here. "Preliminary dating of pottery sherds found at Longforth Farm suggest that the buildings were occupied between the 12th and 14th centuries. "At some stage however, the buildings were abandoned, the useable building materials were robbed out and recycled and the site was forgotten." Bloor Homes is due to start building work on the site at the end of the month. USA – St Augustine - Volunteer Moses Sztylerman pulled out the top half of a clam shell, dark earth still clinging to its ridges, from a trench being dug on property on May Street and handed it to city of St. Augustine archaeologist Carl Halbirt. Not what you think of as an archaeological treasure. But taken in conjunction with other artifacts being found, it helps date a site going back to prehistoric times. “This is one of the biggest (prehistoric sites) I’ve dug,” Halbirt said. He also believes this possibly could be a contact era occupation site, a place where the Timucua Indians and the Spanish had dealings beginning in 1565 when the Spanish landed. If so it’s only the second one documented here. The other is at the Fountain of Youth Archaeology Park, a couple of blocks south. The Park is in the area where Menendez first landed and founded St. Augustine. Halbirt and his volunteers have found lots of shells but also lots of artifacts dating back to the late prehistoric period. They’ve also found fragments of a Spanish olive jar that “could possibly indicate” the area was occupied in the contact period beginning in 1565. Three clearly defined layers can be seen in the trench. The top is a shell midden, with oyster and clam shells, dating from late prehistoric times. Next is a layer of soil. It probably dates from when the area was abandoned; sand blew over and covered the layer below. That bottom layer, which is also a shell midden, includes “a very large trash pit,” something every archaeologist loves. At one end blackened earth and what appear to be bits of charcoal are now visible, a sign prehistoric people may have cooked at the site.“That could be like a fire pit,” Halbirt said. If they can find a piece of charcoal big enough, carbon dating would be possible. The items in the pit — oyster, clam and snail shells, bones from sheepshead and from deer — give some idea of the diet of the tribe. Artifacts in addition to the pottery include shells that were turned into scrapers and digging tools. As they wore out, they were tossed aside and new ones shaped. The archaeologists have found St. Johns check stamped pottery shards. The Timucuas, North Florida’s first human inhabitants, would carve a pattern into small wooden paddles and press those into the pots before they fired them. The pattern helps identify the pieces. In the top layer mixed in with shells and artifacts they have found five shards from a Spanish olive jar dating back to the Spanish contact/colonial period. The site may have been in use until 1600 or so, Halbirt said. The site would be a logical spot for the gathering of shellfish since it is near what was the bend of a creek. USA – Fort Edward - David Starbuck has a job offer that some people will travel hundreds of miles for and get paid absolutely nothing. Their reward is unearthing a fascinating chapter in colonial American history and holding artifacts that no one has touched for more than 250 years. That’s what participants in this year’s SUNY Adirondack Archaeological Field School will experience beginning Monday. Work will focus on a sutlers’ house where civilian merchants sold goods to the 15,000-plus British soldiers stationed at Fort Edward during the French and Indian War. “It’s one of the most exciting military sites we’ve ever worked on in Fort Edward,” said Starbuck, an author and archaeology professor who founded the school in 1991. “There’s still a tremendous amount of material to discover. It’s got so much mystique.” In the late 1750s, Fort Edward was still a frontier outpost and soldiers had very little entertainment while preparing to head north to engage the French for control of the North American continent. At a sutlers’ house, soldiers could usually buy all the tobacco and alcohol they wanted, about the only forms of diversion available. “We’ve found wine bottles, tobacco pipes, specialized drinking vessels and bowls; things you don’t find at most military camps,” Starbuck said. USA – Floride - Space Florida, the state's aerospace economic development agency, wants to build a commercial spaceport next to Kennedy Space Center. Local business and government officials are all for the chosen site, seeing it as a way to boost the future of the Space Coast now that America's shuttle program has ended. But the past sometimes reaches out to trip the future. The property along the Volusia-Brevard county line where Space Florida wants to build its spaceport turns out to be already occupied. It contains the ruins of an 18th-century English plantation, complete with slave villages, a sugar factory and a rum distillery. National Park Service officials have declared it "one of the most significant properties in North America." The Elliott Plantation, built in the late 1760s, covers about 2,500 acres and "contains the remains of a complete sugar works factory ... two overseers' homes and two slave villages," according to a National Park Service archaeology report filed in March. "This is one of the most significant and well-preserved African-American landscapes known, and is unique in its quality of preservation." The plantation operated until 1779, when Spanish privateers raided it and carted off all the plunder they could. The remaining slaves were sold to a plantation in St. Augustine, and the owner abandoned all the buildings, leaving behind "miles of slave-built canals, irrigation ditches, old fields, gardens, roads, paths … and cleared areas where indigo and sugar production were undertaken on a very large scale," the park service report states. The plantation's sugar factory is particularly important, said Dot Moore, the archaeologist who located the ruins. "We think it was the earliest one in North America, so it has a unique historic significance," she said. It was also the southernmost English plantation in the country. FRANCE – Châteaumeillant – Le secret avait été bien gardé : 5.600 objets découverts l’an dernier, à la frontière de l’Indre et du Cher, ont été dévoilés. D'une étrange beauté. Voilà ce qui vient immédiatement à l'esprit quand on découvre pour la première fois, ce lion en bronze massif de 27 cm de long et 17 cm de hauteur aux yeux incrustés d'argent. Il paraît hypnotiser celui qui l'admire pour l'emporter dans son temps : celui de la fin du IIe ou début du IIIe siècle de notre ère. Comme lui, ce sont quelque 5.600 objets de cette époque qui, après avoir été découverts en juillet dernier par une équipe archéologique dirigée par Sophie Krausz sur l'oppidum du puissant peuple des Biturgies Cubes à Châteaumeillant (Cher), se sont dévoilés, nettoyés et restaurés, au musée Émile Chinon, vendredi dernier. « Parmi eux, cinq pièces sont exceptionnelles : une cruche à fond plat et bec tréflé, une serrure en tôle de bronze ornée du visage d'Hercule aux yeux d'argent, un cheval à bec verseur, sorte de samovar russe, et le lion en bronze massif qui constitue la pièce maîtresse de la série », s'est ému, lors de la présentation, Sophie Krausz, en ajoutant : « C'est la première fois que l'on trouve des objets de ce type. Il n'y a aucune comparaison possible en France ni même en Europe ». Et, chose étrange, ils pourraient rappeler un acte rituel de l'époque gallo-romaine, selon l'archéologue et historien Gérard Coulon, ex-directeur du site d'Argentomagus. « Il serait très probable que tous ces objets retrouvés constituent un char, qui aurait été haché menu avant d'être jeté au puits et scellé avec de la terre. » Et d'ajouter : « Le puits pouvant permettre de rentrer en communication avec les dieux souterrains, il ne serait pas impossible que les personnes aient agi de la sorte pour maudire leurs ennemis. D'ailleurs, les petites tablettes en plomb, également retrouvées, confirmeraient cette hypothèse puisque celles-ci étaient d'ordinaire utilisées pour jeter des sorts. » Des révélations qui ne font qu'ajouter de la magie et de l'éclat à ces objets d'outre-tombe. Ceux-ci restent pour l'instant dans leur département d'origine : un point d'honneur pour le maire de la commune, Guy Bergerault, qui s'est engagé à débuter des travaux de rénovation du musée, dès l'automne prochain.